Classic and elegant weddings with a traditional vibe are lovely, but not your thing. What you’re dreaming of is a wedding loaded with originality and personalized touches, from the dress to your venue and from the wedding entertainment to the food. 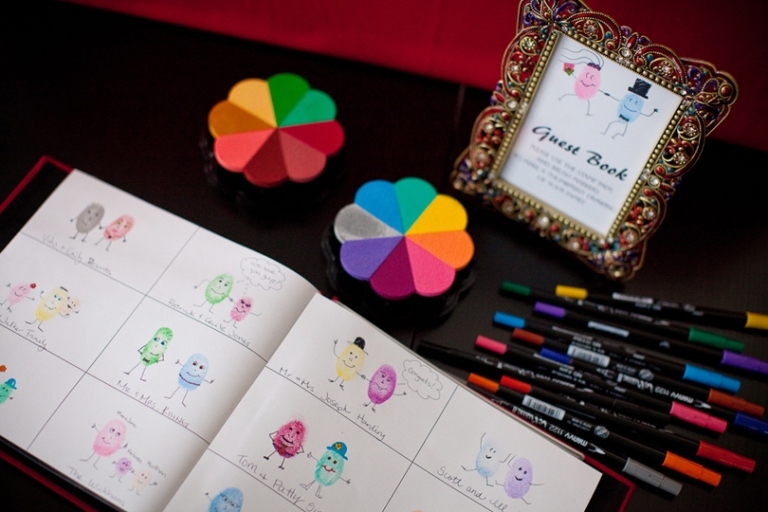 One of the elements that you can easily customize as you wish in order to suit your couple’s personality is the guest book. 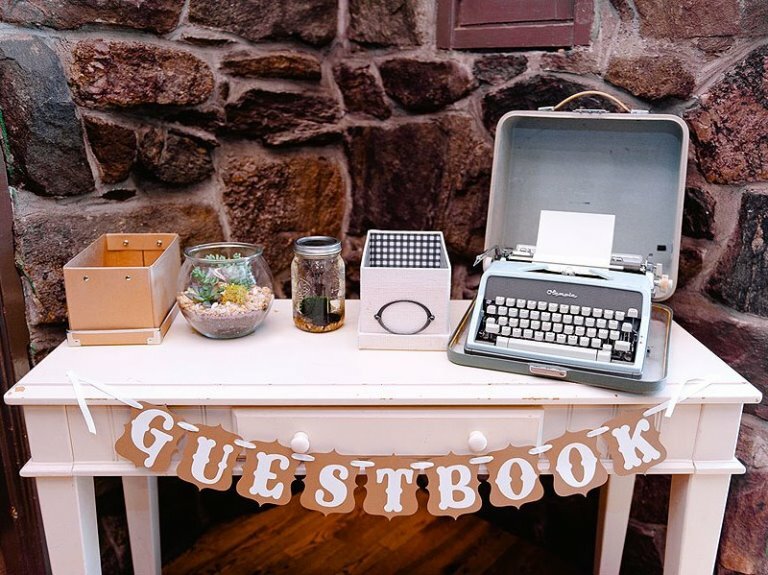 These days, there are tons of alternative wedding guest book ideas out there, from wine bottles to surfboards and fingerprint trees – but which one would work best for your event? Check out our ideas and have your pick! Nothing screams ‘celebration!’ louder than a piñata. 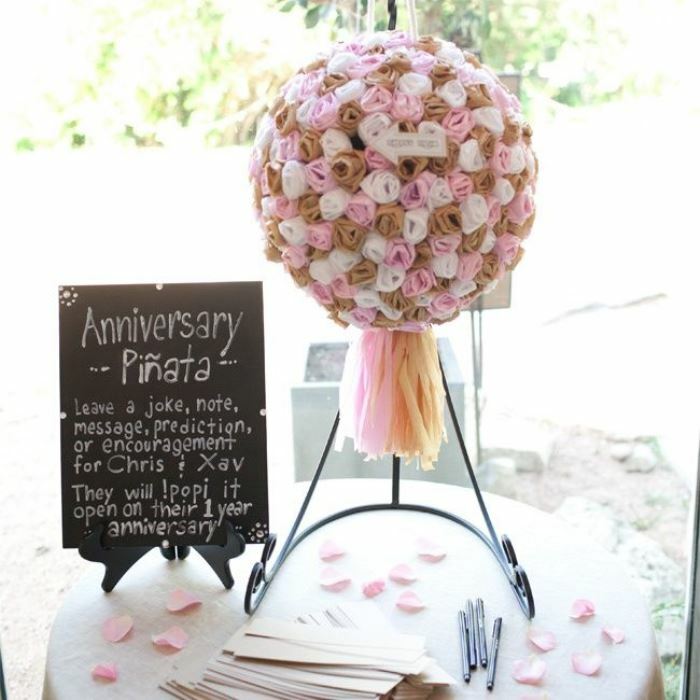 And if you never thought that such a fun element loved by kids and adults alike could function as a guest book, think again: basically, you’ll have your guests write you messages, put them inside and at the end of the party or on your first anniversary, you’ll do the honors and go wild with a stick! Fingerprint trees are a very popular choice when it comes to alternative guest books, but how about this playful art design that is, at the same time, a place for signatures and a future print for your newlyweds home? Your initials, the ‘&’ sign or even the classic ‘Mr. 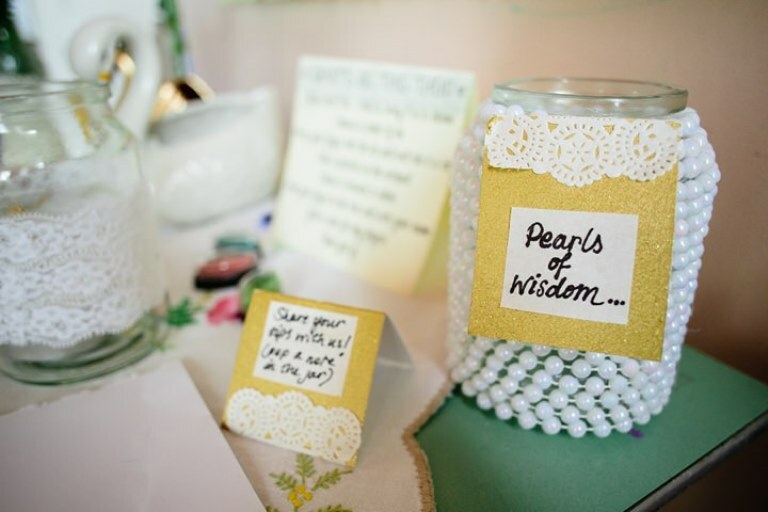 and Mrs.’ letters can be cute décor and a guest book at the same time – have your guests sign them up and keep them in your memory box or displayed in your living room! Letters are a solid idea, but how about puzzle pieces? 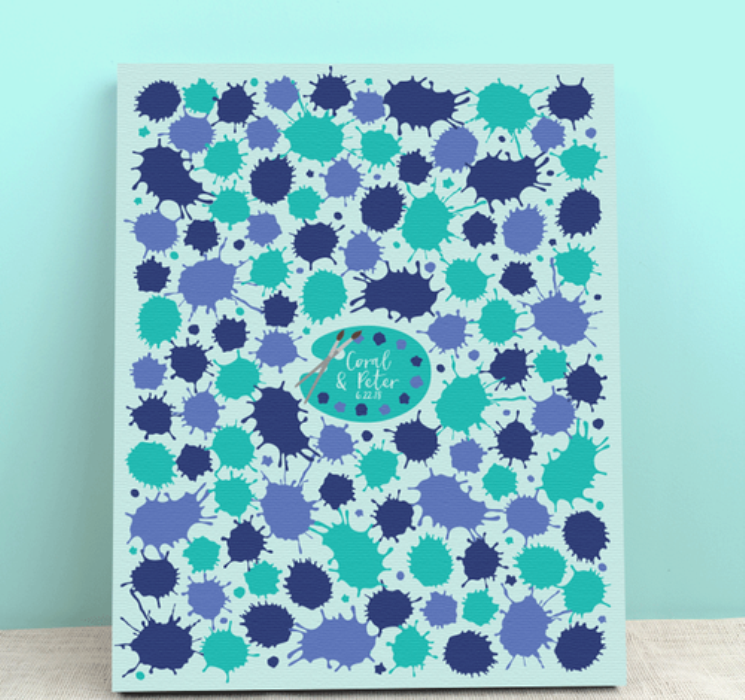 You can opt for this quirky and fun signing option if you’re a fan of the assembling activity and you can do it in different ways: a picture of you, plain pieces, a custom print or a nature puzzle, your choice. Nothing captures the great moments at your wedding better than a candid picture. 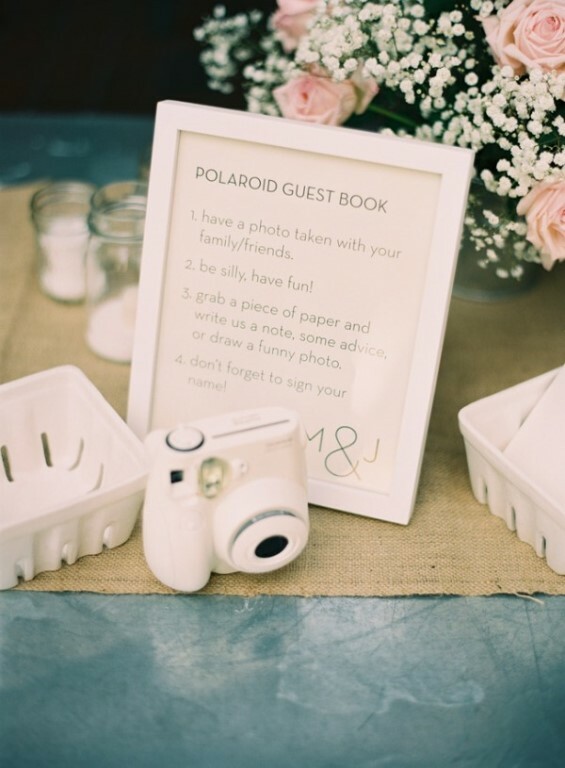 Invite your guests to share their best moments with you by opting for this entertaining guest book idea: Polaroids! 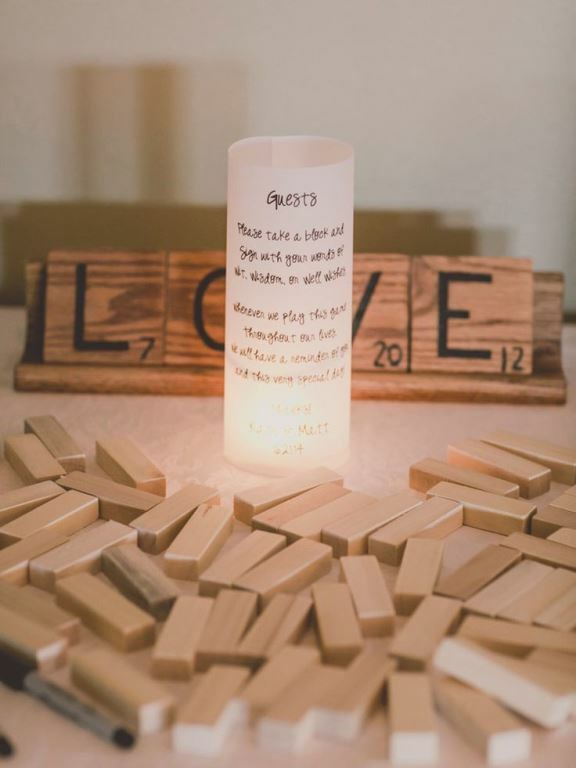 Scrabbles, jenga blocks and even the rummy game can represent great alternative wedding guest book solutions, and you will definitely love to read your guests’ messages while playing a board game with your love post-nuptials. 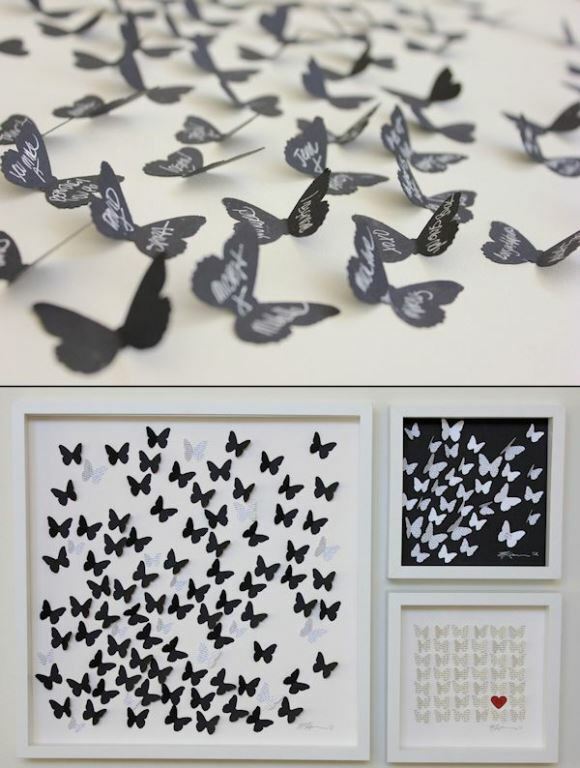 How adorable is this black and white guest book? For sure, it is one for the walls and not stuffed and forgotten in a box! Butterflies are lovely, romantic and symbolize love at its best, so go for this joyful and stylish option if you love it as much as we do! A vintage wedding calls for retro elements: grandma’s lace, old telephones, vintage maps, retro radios and typewriters all make amazing choices that can definitely help you set the mood of your wedding… in the past! 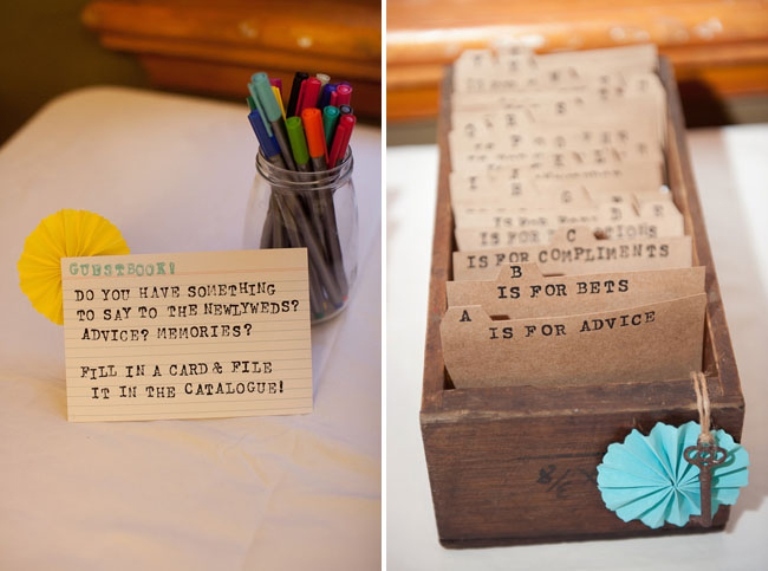 Go all in on this typewriter guest book idea! 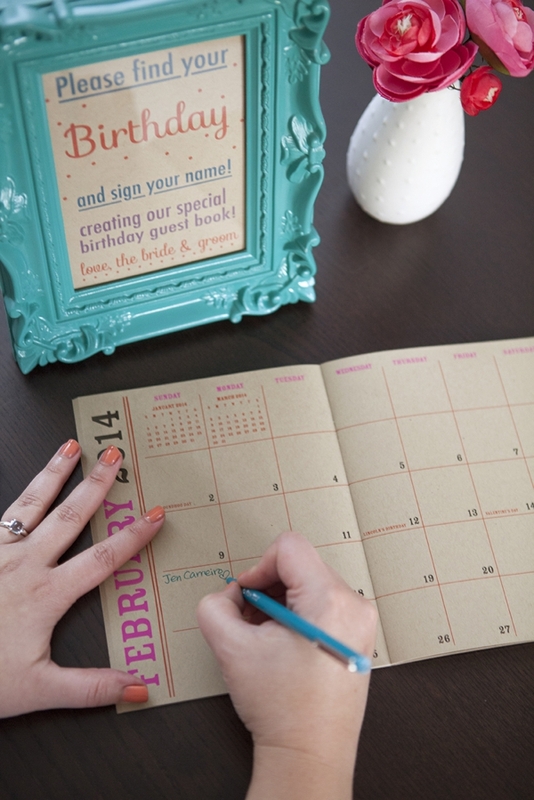 Have your guests sign their names and a few words of wisdom in a calendar, in the box representing their own birthdays. That way, you’ll be able to read their lovely wished throughout the year, while remembering to wish them ‘Happy Birthday’ at the same time. Instead of the classic wishes, invite your friends and family to write a few pearls of wisdom from their experience to help you start on the right foot on this new journey. 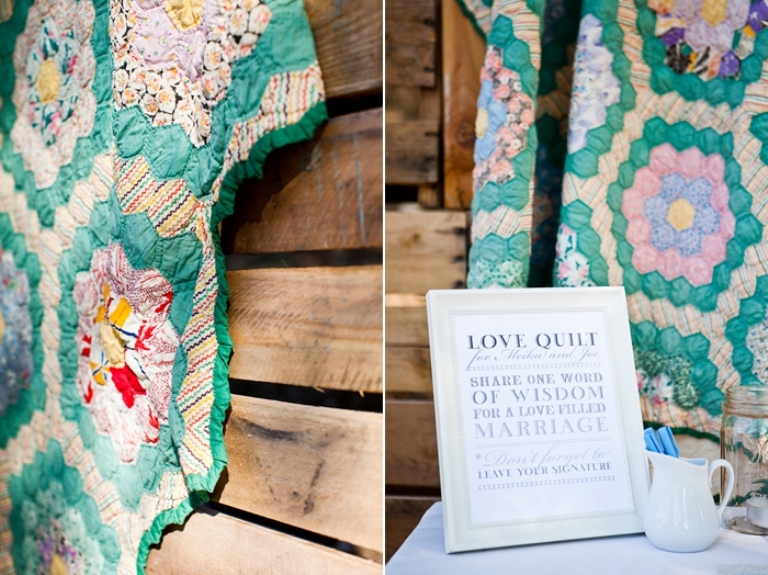 Another practical alternative wedding guest book: a love quilt! Cuddle with your love under a customized quilt, ‘decorated’ with words of love from your dear ones! 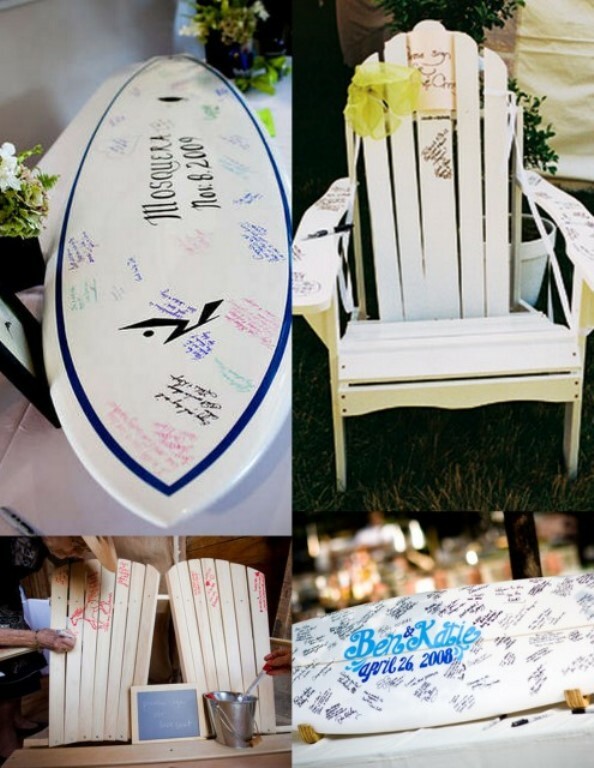 A beach wedding is not complete without this quirky guest book: a surfboard! If you or your partner are beach-goers who love to surf, look no further, as you’ve just found the perfect platform for all the signatures. Organic elements and nature-inspired details are always a nice touch in an outdoor wedding. 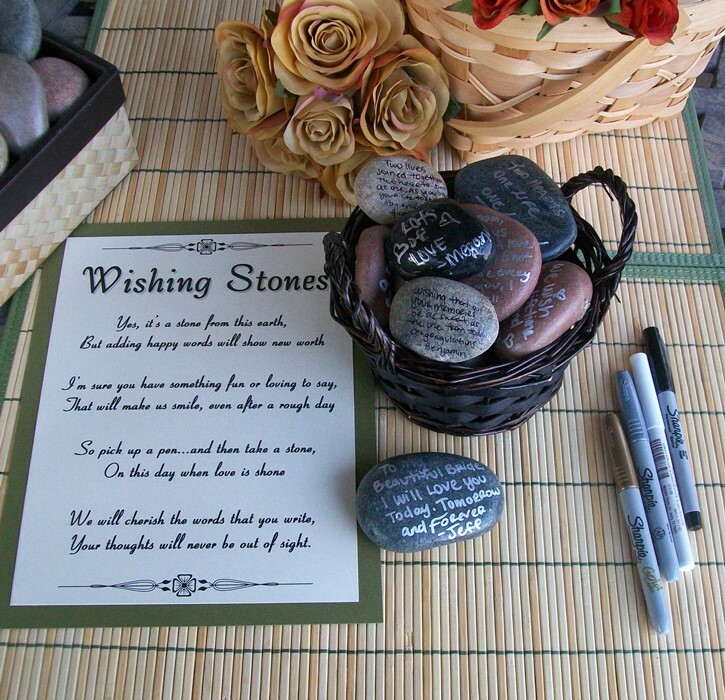 For example: guest book stones! 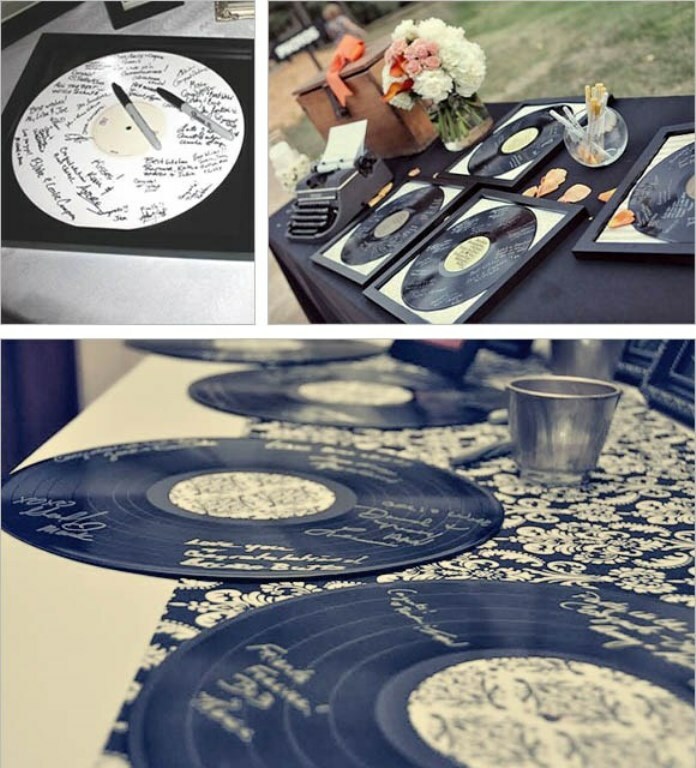 If music is a big part of your life, then a musical guest book is all what’s missing from your celebration of love – take a look at these retro vinyls, where the guests can write their wishes and advice during the reception. 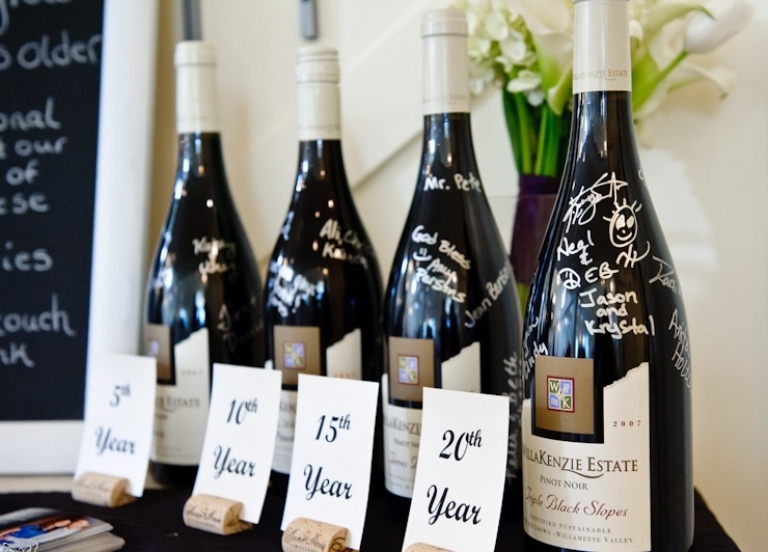 Champagne and wine bottles make great alternative wedding guest book ideas, as they are both practical and enjoyable – what’s even better: you can open the bottle on your wedding anniversary and read the wishes over a glass of wine. 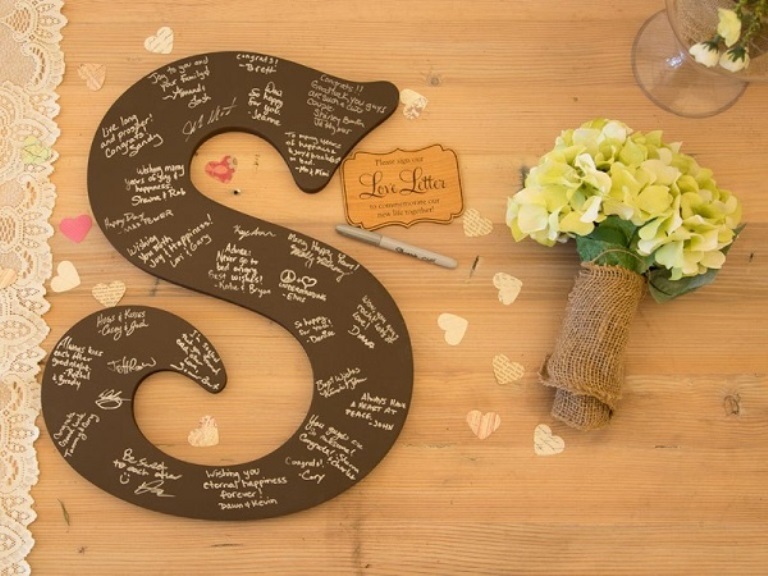 A perfectly organized guest book, from A to Z – gives the guests the option to choose their favorite category, whether it is ‘advice’, date night ideas’, ‘wishes’, ‘bets’ or ‘compliments’. Instead of trees and balloons, opt for a book filled with cute and funny fingerprint characters representing your guests! 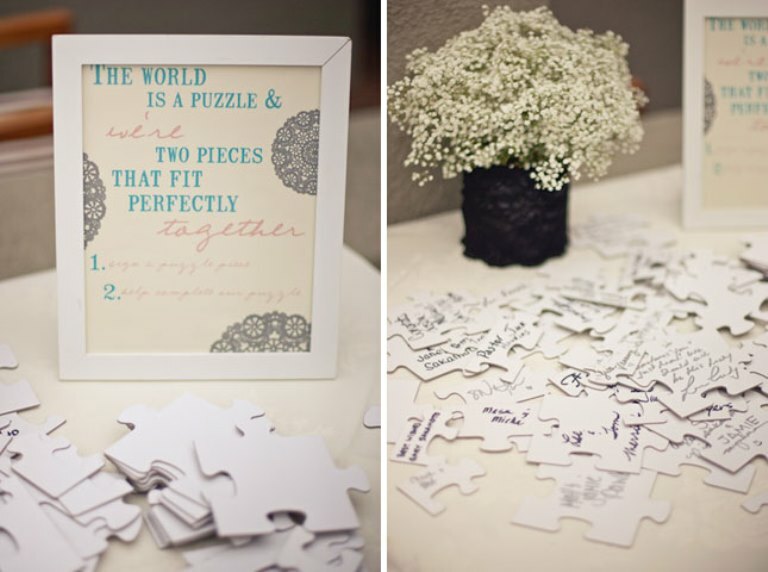 Have the guest circle a word in the dictionary that represents your big day best. It will definitely be a blast reading them later on with your soul mate! 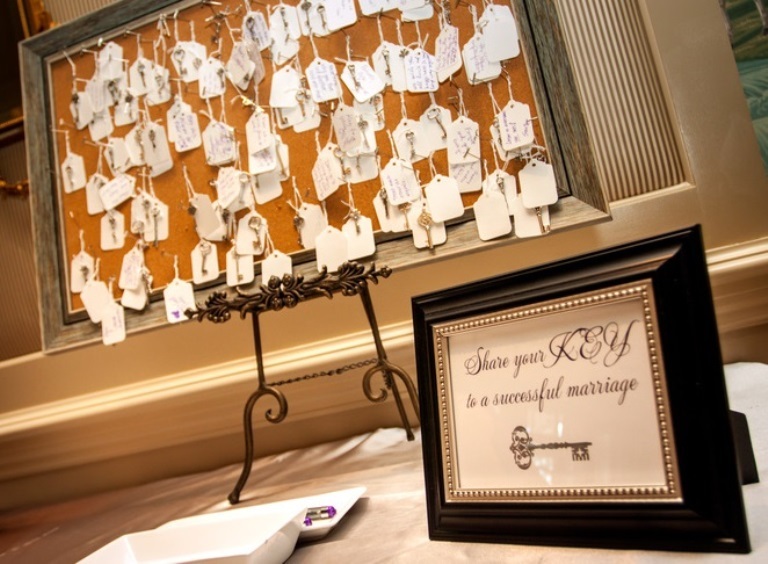 Keys are a great symbol to use as part of your alternative wedding guest book – check out this lovely setting, full of romanticism and whimsy! 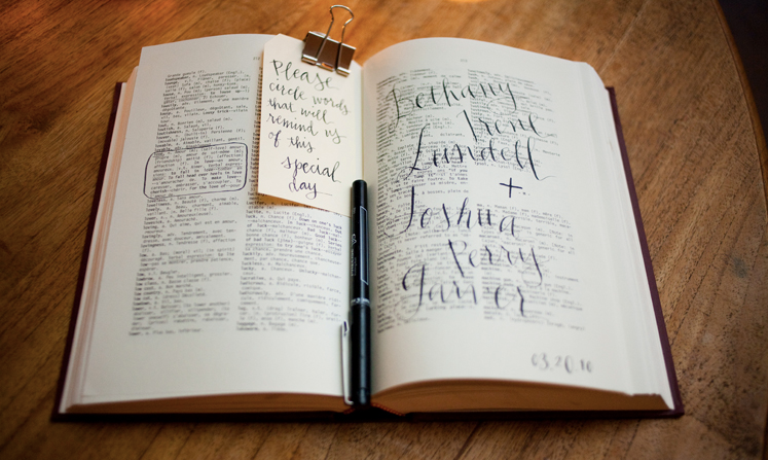 For a couple that loves traveling, this is the perfect guest book. 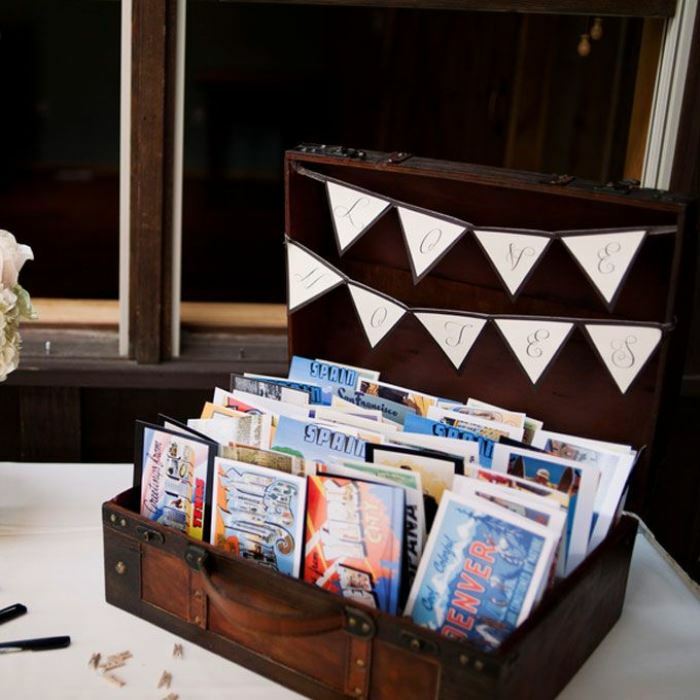 Collect vintage postcards prior to your wedding for a nostalgic touch on your guest book table.